We have a serious crush on San Diego. We first visited over two years ago, and Elaine instantly fell in love with the city. Taylor was slower to warm the city, and it wasn't until she actually fell in love in San Diego that she started to appreciate this chill, sunny, vegan-friendly town. It was so fun for us to explore the city together last week, and we found the most amazing spot in South Park to share with you! Kindred is a vegan restaurant and cocktail bar that is both pretty and goth. If you were to combine the two of us and make a restaurant out of our personalities, this would be it. 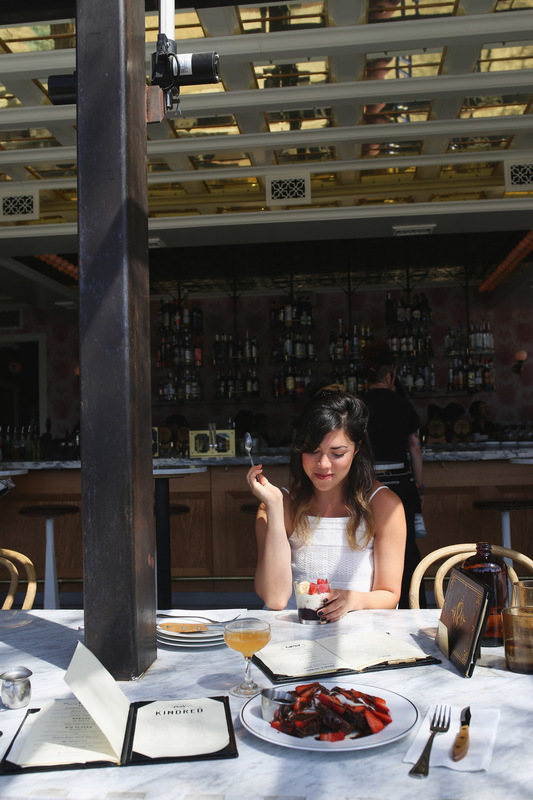 There's tons of natural light and mirrored ceilings perfect for selfies, the open-air seating is ideal for the San Diego sunshine, and there's ample gluten-free options. Oh, and it's super affordable and delicious. The restroom soundtrack may be exclusively death metal and a little frightening, but the cocktail menu is more approachable. We stopped by for brunch, which was only about $10/plate. Amazing. Everything is vegan, but you definitely won't leave here hungry. Vegan banana bread pudding or gluten-free banana bourbon pancakes, anyone? We can't wait to come back here to experience it at night next time! Heading to San Diego? Check out our local San Diego city guide here!